Ubisoft pulls inspirations from so many different directions to create an RPG of enormous scale and substance. What is it? A sprawling action RPG set in ancient Greece. Of all the Assassin’s Creed games, Odyssey is the most aptly named. It's a roleplaying game of mythic proportions, a world so vast and intricately detailed I feel lost in it all. This isn’t just Ubisoft’s usual style of open world draped over the Aegean Sea, either. There’s still that familiar scattering of icons that covers each of its 30ish zones, but Odyssey’s various activities weave into a satisfying web of interlocking systems. Previous Assassin's Creed games were full of mundane activities that existed merely to check them off a list, but nearly every pursuit in Odyssey folds back into its overarching quest in some way. Many of Odyssey's zones could host a smaller RPG on their own, but together they form an incomparably large world full of things to do. Odyssey sheds so much of what Assassin’s Creed is known for to fully embrace the core concepts of a roleplaying game—and it's all the better for it. Even though the story doesn't live up to its initial premise, the additional layer of choice, breathtaking scenery, and colorful sidequests make Odyssey not only the best Assassin's Creed to date, but one of the best RPGs since The Witcher 3. Breathtaking scenery and colorful sidequests make Odyssey not only the best Assassin's Creed to date, but one of the best RPGs since The Witcher 3. Unlike previous Assassin's Creeds, dialogue options now let me influence major and minor quests—sometimes with horrific consequences. I refused to intervene when a priest wanted to put a plagued family to death, incited more than one rebellion, and even spared a shamed general from what should have been a very satisfying dish of stone-cold revenge. And, yes, I've also bumped uglies with quite a few willing characters. These frequently wonderful side quests are spread out over a world that is almost incomprehensibly large for a singleplayer RPG. Normally size doesn't matter, but the sheer scale of Odyssey's ancient Greece is to its benefit, especially because each area feels so distinct and detailed. It's a vast world that I want to explore, and each zone has a subtle aesthetic that makes it unique, from the arid badlands of Crete to the verdant plains of Arkadia. This isn't just Ubisoft's biggest game ever, it's also it's most beautiful. The new 'exploration' mode makes exploring that world a lot more immersive. Enabled by default, this turns off most of the quest markers and instead provides me with vague directions to objectives, like saying it's located north of the agora in Athens, leaving me to suss out the exact location on my own. Sometimes that's as simple as using my eagle, Ikaros, to scout out the location from above, but other times it means speaking with characters or taking on extra quests to get more information. When I failed several subquests to discern the location of an assassination target, I had no choice but to ride around Boetia using my own faculties to find his campsite. If you have the patience for it, it's a system that makes exploring more involved and satisfying. If there's one casualty of Odyssey's massive world, though, it's the main story. If there's one casualty of Odyssey's massive world, though, it's the main story. No matter which of two siblings you pick, Kassandra or Alexios, there's a lot of heart in their journey to reunite their family. True to Assassin's Creed, Odyssey tries to tell a story that sees Kassandra rub elbows with all of the biggest names in ancient Greece, but the end result is a story that has charm but often feels disjointed and confusing. It simply tries to do too much, whisking you from the backwater island of Kephalonnia to heights of Athenian society and then to audiences with Spartan Kings. This frantic pacing doesn't leave much time to really know or appreciate these characters, and the reasons I was pulled from one area to the next sometimes felt paper thin. It's still an enjoyable tale, but The Witcher 3 this is not. 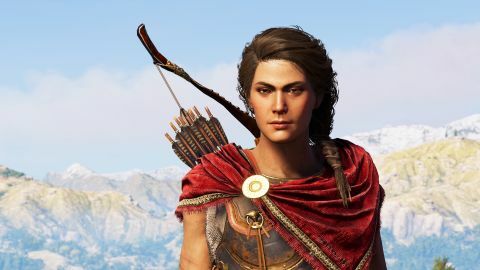 That's pretty standard for Assassin's Creed, but having agency in the story has done wonders for making me more attached to Kassandra’s journey. Even if certain revelations left me confused or rolling my eyes, I felt invested in what was happening. One thing worth mentioning is that Odyssey's story features some pretty stiff level gaps that have to be overcome by diverting time to complete side quests and other activities. I didn't mind it, since all of those experiences are fun, but it will be annoying to anyone who wants to just focus on the main quest. I don't really mind that the story doesn't always work because Odyssey is an RPG that thrives thanks to its diverse and excellent activities. Black Flag’s ship combat makes a return as a central feature, though it's slightly simplified to be less of a grind. I love the feeling of boarding the Adrestia and sailing the open waters, cleaving pirate triremes in half or pulling alongside to battle them hand to hand. Then there’s the new Mercenary system, which is inspired by Origin’s Phylakes but, again, is bigger and better. Instead of just 10 ultra-tough enemies wandering the world trying to skewer me, there are 39 partially-procedural mercenaries who wander about and, if I cause too much trouble, will try to collect the bounty on my head. These mercenaries remind me of Shadow of Mordor’s nemesis system, albeit without personalities that evolve with each encounter I have with them. But they do have distinct looks and a way of showing up when I’m already vulnerable, like Skiron, "The Crazy Lover," who had a sixth sense for sabotaging my stealthy infiltrations and getting me killed until I put an arrow through his weiner. Now he's just Skiron, The Crazy. Odyssey retains the same MMO-style leveling system of Origins, meaning enemies who outrank me by even a few levels will be practically invincible no matter how well I fight. That’s still annoying—especially when I want to take on a new story quest but discover its level is beyond mine—but in the case of mercenaries I like how it establishes a food chain. When I saw Exekias the Legend, a level 50 merc, roaming around Delphi with his pet bear, I felt like I bumped into a celebrity. The mercenary pecking order is just one of half a dozen secondary progression systems in Odyssey. It might sound like feature bloat, as if Ubisoft's open world games needed even more things to do, but each of these systems overlaps and influences the others in a way that makes Odyssey a lively and dynamic world. Each of these systems overlaps and influences the others in a way that makes Odyssey a lively and dynamic world. Across most of the zones, for example, Spartan and Athenian armies clash for control of territory. When one faction controls a zone, I can destabilize its grip on the region by killing soldiers, or burning and stealing supplies found in their heavily-guarded camps. When a faction’s control of a region is all but lost, a Conquest Battle opens up and I can enlist to fight on either side in exchange for powerful gear. In these set-piece battles, hundreds of soldiers take the field at once in an all-out fray to see which side is the last standing. It's a serious challenge made even more brutal if the opposing faction enlists a mercenary to ambush me. It’s in these moments that Odyssey’s combat system really shines. It’s functionally the same system from Origins, which means it can sometimes feel a little mushy and unresponsive, but new abilities that slot into an action bar give me so many cool tools to use in combat that it doesn't get on my nerves nearly as much. Even during enormous battles, Assassin’s Creed: Odyssey’s performance doesn’t dip, but you'll still need a beefy rig if you hope to get good performance. I’m playing on an i7 8700 with a GTX 970 and 16GB of RAM—a machine that slightly exceeds the "recommended" system requirements for playing on "high" settings at 1080p and 30 fps. Playing on those same settings, I'm getting an average of 55 fps in most areas, with my CPU load averaging around 50 percent with spikes as high at 80. Aside from the steep requirements, Odyssey has been stable and easy to alt-tab out of. In 50 hours, I've only had one glitch that forced me to restart. Aside from some goofy AI, the experience has been smooth. Normal attacks build generous amounts of adrenaline, which can then be spent unleashing any one of these four abilities, like the Spartan Kick. It’s an even cooler Fus-Ro-Dah from Skyrim as Kassandra launches a foe backwards with a detonative kick. There's some clever combinations too, like using Rain of Destruction with explosive arrows to unleash an Ancient Grecian carpet bombing. Even if the combat system could still be more responsive, I like that Odyssey embraces combat over stealth more than any other Assassin’s Creed, because these new abilities make me feel like a god of war. My favorite punching bag are the Cult of Kosmos, the conspirators who tore my family apart. . It's a lot of leg work hunting down these 44 cultists across Odyssey's big map, but it's a testament to how well Odyssey's systems talk to each other that this is one of the best parts of the game. Many cultists are unmasked as part of the main story, but the rest require scouring the world for clues to their identity. Sometimes I might have to complete an out of the way sidequest, while others require reading stolen letters to deduce their location. One cultist was hiding in a bear den in Malis, which required setting out to explore the countryside using my eagle, Ikaros, to try and spot likely locations. Another required weakening Athenian control over a pair of islands to draw them into a naval Conquest battle. Others might be easier to actually find but then require a stealthy infiltration into a labyrinthian fort full of guards. Fans of older Assassin's Creed games can rest easy knowing that stealth is still big part of Odyssey. Sneaking into heavily guarded forts and estates is how I’ve spent a good half of my time, but the system remains largely unchanged from previous games. I still use my eagle to mark enemies and various objectives, and there’s still that familiar tension of trying to slink through an enemy camp unseen. My only problem with stealth is that it too often reveals how dumb and inconsistent Odyssey’s AI is. My only problem with stealth is that it too often reveals how dumb and inconsistent Odyssey’s AI is. More than once I’ve had guards get stuck on objects while patrolling or have had to sit back and watch as they run around in a panic seemingly caused by nothing. And nothing ruins the immersion of a leisurely horse ride through Athens like civilians desperately diving out of the way like they just dodged an incoming train. So while Odyssey is easily the best Assassin’s Creed I have ever played, and a damn good RPG to boot, there's still some fundamental parts that could've been improved. When I look back on all the fun I’ve had, these complaints feel minor. Assassin's Creed Odyssey is enormous and beautiful, and it effortlessly ties action, stealth, sailing, faction control systems, mercenaries, and cultist hunting together into one cohesive game that, even after 50 hours, I want to keep playing. Odyssey is a lot more than just another Assassin’s Creed, it’s an RPG of unparalleled scale supplemented by satisfyingly layered and deep progression systems that each play their part in bringing ancient Greece to life.